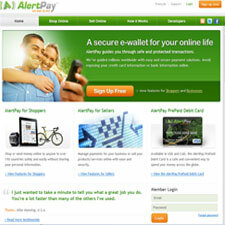 Alertpay credit card processing gateway provides international payment capabilities to send money securely through email or other online tools. Based in Montreal, Quebec, and founded in 2004, all monies deposited with AlertPay are FDIC insured, and they specialize in fascilitating the processing of monies online without exposing personal or financial information. As a payment gateway for credit card processing, AlertPay can help you process credit cards without the need for a merchant account.